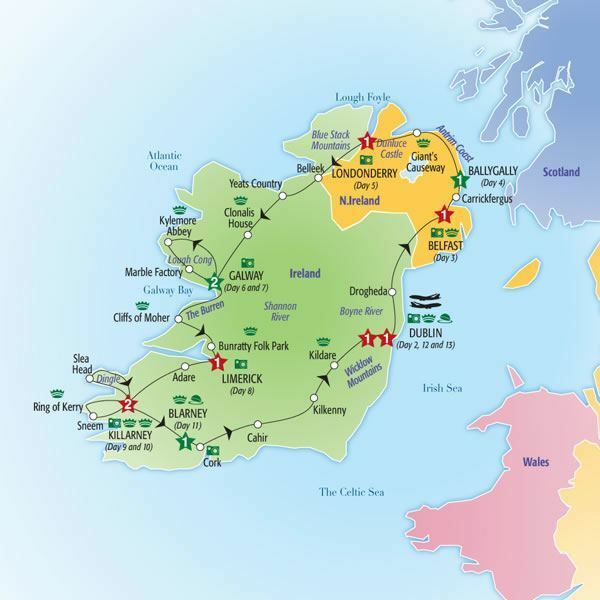 Come join in the ‘craic’ on this convivial jaunt around the Emerald Isle, furnished with ruined castles, towering cliffs, historic towns, quiet lakes and natural wonders. 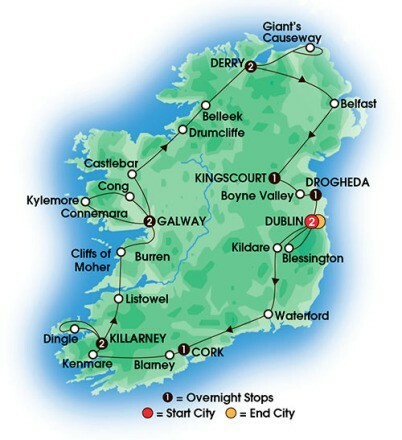 Dublin: See Custom House, Dublin Castle and O’Connell St.
Kilkenny: See the Castle and visit the Design Centre. Cahir: Stop for a photo of the massive castle. Dingle Peninsula: Enjoy a scenic tour to Slea Head. Limerick: See King John’s Castle, the Cathedral and Treaty Stone. Galway: See St. Nicholas Cathedral, Spanish Arch & Eyre Square. Drumcliffe: Visit the final resting place of Irish poet Willain Butler Yeats. Londonderry: See ‘Derry’s Walls’ and Gothic guildhall. Carrickfergus: Drive around the immense Castle. Belfast: See City Hall, Queen’s University and Stormont Castle. 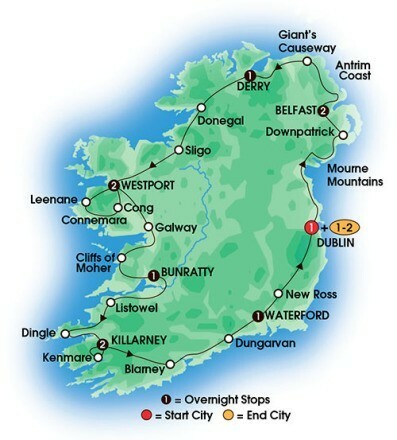 Scenic drives: Antrim coast, Connemara, Ring of Kerry, Dingle, Burren. Cork: The elegant Radisson Blu Hotel & Spa offers a country retreat close to urban delights. Killarney: Choose from a selection of fine restaurants for your Dine Around Evening. Ballygally: After circumnavigating the Emerald Isle, there’s bound to be a fare share of craic in the room at your grand finalé Celebration. Sláinte! Welcome Reception (WD), 11 full Breakfasts (FB), 3 three-course Evening Meals with choice, plus tea or coffee (D) and 1 Celebration Dinner (CD). Dublin: Breathe the air thickened by the musty tomes of Trinity College Library and see the lavish 9C Book of Kells. Kildare: Experience a behind the scenes look at the Irish National Stud and Japanese Gardens. Kilkenny: Learn first hand from a true craftsman, the art of making the Hurley, used in the ancient Celtic game of Hurling. Cork: Visit the English Market and meet a local market stallholder who introduces you to a taste of delicious farmhouse cheese. Killarney: Venture into a world of towering cliffs, lush lakelands and remote villages, as you tour the magical Ring of Kerry. Killarney: A local ‘Jarvie’ informs you of the history, legend and folklore of Killarney aboard a famous jaunting car ride. Connemara: Visit Kylemore Abbey, one of Ireland’s most romantic buildings. Belleek: Meet some of the specialist crafts people and enjoy a guided tour of the porcelain production process. Giant’s Causeway: Learn about the towering hexagonal basalt columns – a geological spectacle to behold.